Have you seen the latest issue of Adore Home Magazine? My favorite part of the entire (amazing!) issue is editor Loni Parker's 30th birthday party. 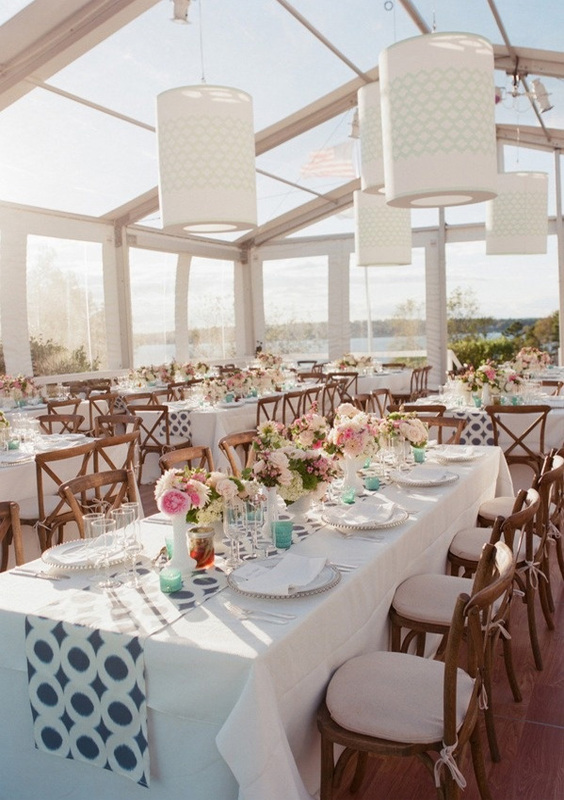 The decor and color scheme is simple, elegant, fresh and feminine. 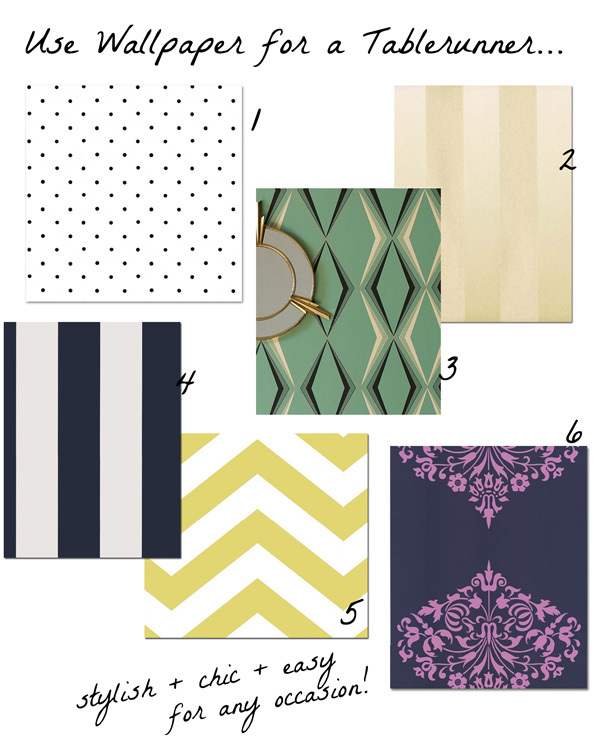 The best part is that the gold chevron table runner is actually wallpaper! 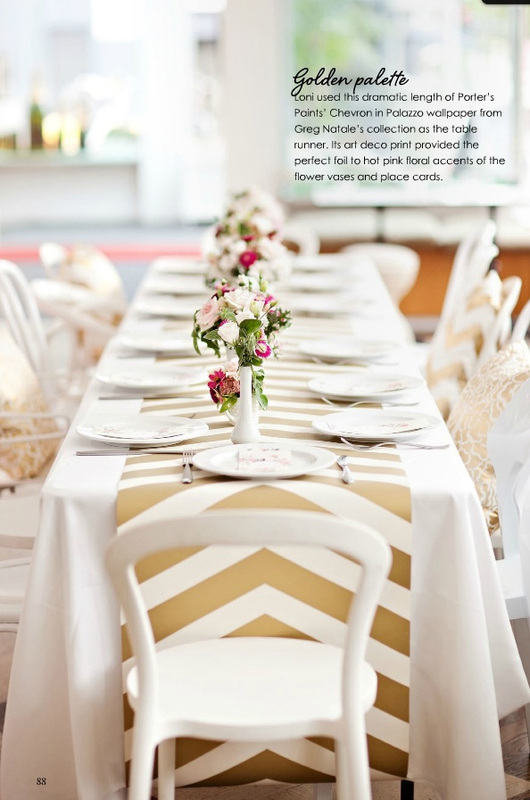 I never would of thought to use wallpaper to decorate a tabletop, but what an incredible idea. Most wallpaper rolls are about 21" wide, making it the perfect size to run down the center of a dining table - no cutting, gluing or sewing necessary. There are thousands of beautiful wallpapers out there to choose from in all different price ranges - the sky really is the limit with the design of your next party! 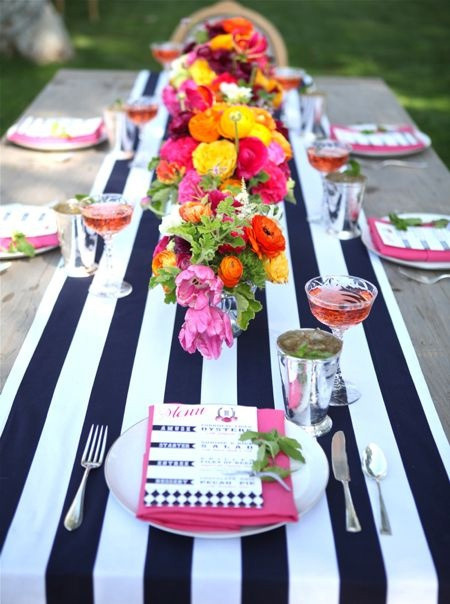 As I looked around Pinterest, I found a couple other dramatic tabletops (both fabric) that give even more inspiration on what a pop of bold pattern can do for a table setting. What do you think about this idea? Genius!! I love this idea! I know, it's pretty amazing, right?! Can't wait to try it myself. LOVE these ideas! Beautiful table tops. Very pretty! I especially love the navy/white stripe with the hot pink. Brilliant idea! They look amazing. No laundering required, either. Bonus! Very inspired post, they all look amazing. well done and thank you for sharing. Love the navy striped with the bold colors! Absolutely stunning.